In the fertile valley of the Apies River, at the foot of the Magaliesberg range, Pretoria is known as the Jacaranda City thanks to the blaze of purple blooms that brighten its many parks and gardens in the spring. 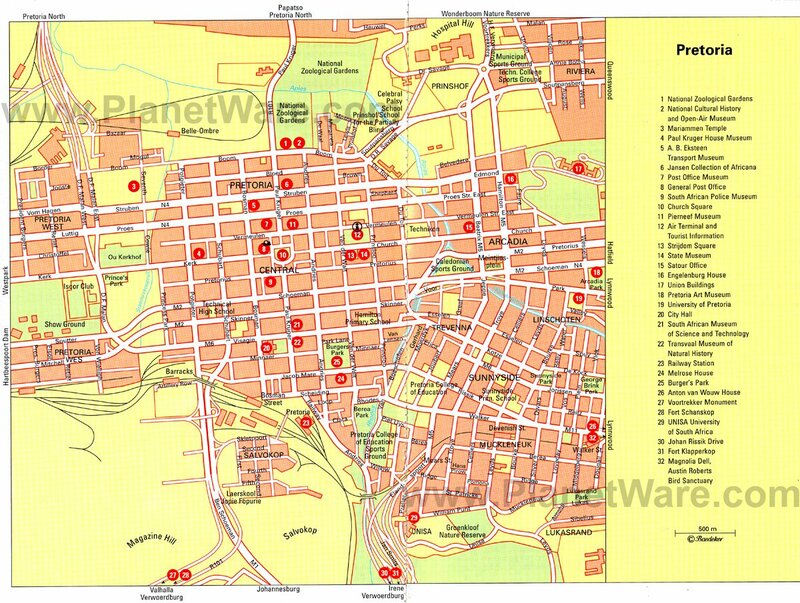 Pretoria is also the administrative capital of South Africa, sharing capital city status with Cape Town and Bloemfontein. The city lies about 55 kilometers from Johannesburg, yet the two cities seem a world apart. Pretoria is a city of civil servants, diplomats, and trim and tidy residential districts with a large population of Afrikaners. It is also an important industrial town and an educational and cultural hub. The University of Pretoria was founded in 1930; and UNISA, the University of South Africa, is one of the largest open universities in the world. Top tourist attractions include the city's many historic buildings, monuments, and museums, as well as its beautiful botanical gardens and nature reserves, some of which offer excellent game-viewing opportunities just a short drive from the city center. The Pretoria National Botanic Garden, in the city's eastern suburbs, is a peaceful oasis close to the city. The 76-hectare gardens spotlight South African species with more than half the country's tree species as well as many flowering plants, cycads, aloes, and other impressive collections. A quartzite ridge slices the park into two sections, with vegetation in the warmer north-facing half contrasting with that in the colder south-facing section. The plants are grouped according to their climatic region, such as the savannas of the Karoo, coastal forests, and the grassland plains of Namibia. Paved nature trails lead through the natural vegetation of the rocky ridge above the garden. Also on the grounds, the National Herbarium is home to the largest collection of plant specimens in South Africa with more than a million species catalogued and stored here. After exploring the lovely gardens, visitors can enjoy a meal at the lakefront restaurant. High on a hilltop south of the city center, the Voortrekker Monument is a South African National Heritage site and one of the country's most visited historic monuments. It was built in 1949 to commemorate the Voortrekkers, the Boers who pushed northward into unknown territory in the mid 19th-century. This 40-meter-high square granite structure is a prominent landmark in the city with steps leading up to the Hall of Heroes where 27 marble reliefs depict the Great Trek of 1838. Surrounding the monument is a wall depicting ox-wagons representing the trek wagons. On 16 December each year, a shaft of sunlight shines through an opening in the dome and illuminates a cenotaph below, which reads. "Ons vir jou, Suid-Afrika" ("We are for you, South Africa"). Occasionally, the hall hosts classical music performances, which highlight its excellent acoustics. Museum exhibits depict snapshots of life during this important period. After browsing the interior, visitors can admire panoramic views of Pretoria from the roof or enjoy a meal at the restaurant. Spanning 85 hectares, the National Zoological Gardens of South Africa provides a full day of animal fun for the family. This large zoo encompasses a walk-through aviary, a reptile house with a collection of animals from all over the world, as well as the country's only inland aquarium where visitors can see many species of fish including ragged tooth sharks. Among the large mammal collection, highlights include the lion and tiger exhibit, hippos, and elephants. To tour the zoo, visitors can rent golf carts by the hour, ride the cableway for a bird's eye view, or stroll along the paths for a close-up look at the animals; wear comfortable shoes as the grounds are expansive. Night visits and overnight camping adventures are also available. At the Ann van Dyk Cheetah Centre, about a 45-minute drive from Pretoria, animal lovers can get up close and personal with some magnificent African creatures. This non-profit center was established in 1971 as a cheetah breeding project and has since successfully bred African wild dogs, Cape vultures, and brown hyenas among other animals. The center was also the first breeder of the rare king cheetah. Visitors can choose from a variety of educational tours, including a three-hour guided tour and touch experience where guests accompany keepers on the feeding rounds and enjoy a petting experience with these graceful animals. This is a fantastic opportunity for photographers to capture close-up images, and the cost helps fund conservation projects. Set in beautiful gardens, the Union Buildings command the highest point of the city on Meintjieskop Hill near historic Church Square, site of the city's first settlement. Designed by Sir Herbert Baker in 1913, this impressive range of sandstone buildings mixes Italian Renaissance, English Renaissance, and Cape Dutch styles. It's the seat of government and also houses the offices of the president and the state archives. In the gardens, which slope down in terraces to Church Street, are the Delville Wood Memorial, commemorating the South African soldiers who fell in the First World War; statues of the South African prime ministers Louis Botha, J. B. M. Hertzog, and J. C. Smuts; as well as a nine-meter-tall statue of Nelson Mandela. Visitors come here to stroll among the gardens, ogle the architecture, and admire the impressive city views. The site also holds a special place in the hearts of many South Africans after former President Nelson Mandela's inauguration took place here in 1994. Sitting on Salvokop Hill with panoramic views, Freedom park traces the story of South Africa's liberation and honors those who played an important role. The site opened to the public in 2007 and encompasses a series of poignant memorials and an impressive museum with exhibits examining the nation's history from the dawn of humanity to the present day. The site overlooks the nearby Voortrekker Monument and other key landmarks of the city below. A highlight is the Wall of Names, inscribed with the names of all those who lost their lives in South Africa's major conflicts; an eternal flame; and the Gallery of Leaders, an inspirational look at role models on the road to freedom. Guided tours take about two hours and provide fascinating insight to the stories represented here as well as the symbolic features of the architecture. A haven for hikers and nature lovers, Moreleta Kloof Nature Reserve spans 100 hectares in the foothills of Moreleta Kloof near the city center. In the 19th century, the reserve was a dairy farm, and one of the original buildings has been converted to a restaurant where visitors can dine on a beautiful deck, often with a parade of animals in view. Springbuck, impala, bushbuck, zebra, and ostrich are among the wildlife found in the park, as well as an abundance of birds. A tributary flows through the reserve providing water for the animals, and hiking trails range in length from 1.5 kilometers to more than three kilometers. Other lovely green spaces close to the city center include Faerie Glen Nature Reserve, part of the Moreleta Spruit Nature Trail, which follows a winding course along the banks of a stream through ever-changing scenery, as well as Groenkloof Nature Reserve with hiking, horseback riding, and 4WD trails. Birders will enjoy the Austin Roberts Bird Sanctuary named after the South African ornithologist who wrote a popular handbook on the birds of South Africa. Bird hides line the shores of the reservoir and more than 100 indigenous species make their home here. Melrose House, a National Monument, offers visitors the experience of stepping back in time to the late 19th century. Built in 1866 by wealthy businessman George J. Heys, this handsome Victorian house was where the Treaty of Vereeniging, the Peace Treaty terminating the Anglo Boer War, was signed in 1902. Filled with antiques, the house is an excellent example of preserved Victorian architecture. Highlights include the stained glass windows, porcelain ornaments, paintings by British artists, and ornate architectural flourishes. Guided tours are available. The house is also used for art exhibitions, concerts, and antique fairs, and the cafe serves snacks in the tea garden. Ditsong Museums of South Africa is a group of eight national museums with significant cultural collections. The Ditsong National Museum of Natural History, formerly known as the Transvaal Museum, has an extraordinary collection of mammals, amphibians, fossils, geological specimens, and archaeological material. In the Austin Roberts Bird Hall, visitors can see more than 800 species of birds indigenous to South Africa. Another Ditsong Museum is the National Museum of Cultural History with Bushman rock engravings, an ethnological section, Cape Dutch furniture, silver, and archaeological material. The Kruger Museum, a modest Victorian house in Church Street, is the oldest and best known house in the city. From 1883 to 1900, it was the home of Paul Kruger, President of the former Transvaal Boer Republic, and is now a museum with mementos and exhibits relating to his life and the politics of the time. Sammy Marks House is another historic house worth visiting. This grand Victorian mansion was home to the successful industrialist and his family from 1885 to 1909 and still contains most of the original furniture and ornaments. After a tour here, visitors can enjoy tea and scones in the garden. On the outskirts of Pretoria, Rietvlei Nature Reserve offers a peaceful escape to nature and great game viewing less than a 20-minute drive from the city center. The dam was built during the Great Depression, and now constitutes 15% of Pretoria's water supply as well as supporting a range of highveld game that was reintroduced to the area. Eland, red hartebeest, buffalo, blesbok, waterbuck, zebra, black wildebeest, hippo, and even cheetah are among the animals found here, and lucky visitors may even spot the resident white rhinos. Birders should keep a lookout for the comical secretary birds, as well as the blue crane, South Africa's national bird, and a breeding pair of fish eagles. The reserve encompasses 3,800 hectares of rolling hills, sprawling grassland, well-marked roads, and of course, the dam itself, where anglers can cast their lines from the northern and western shores. Other highlights include the lion tours, hiking and horse trails, bird hides, a popular tea garden, and a playground to keep the kids entertained. Menlyn Boutique Hotel: luxury boutique hotel, excellent service, stylish decor, gourmet restaurant, spa and wellness center. Southern Sun Pretoria: mid-range hotel, comfortable rooms, palm-shaded pool, fitness center. Morning Star Express Hotel: 3-star hotel, welcoming staff, contemporary decor, shuttle service. Holiday Inn Express Pretoria-Sunnypark: budget hotel, connected to a shopping mall, modern rooms, lovely outdoor pool.